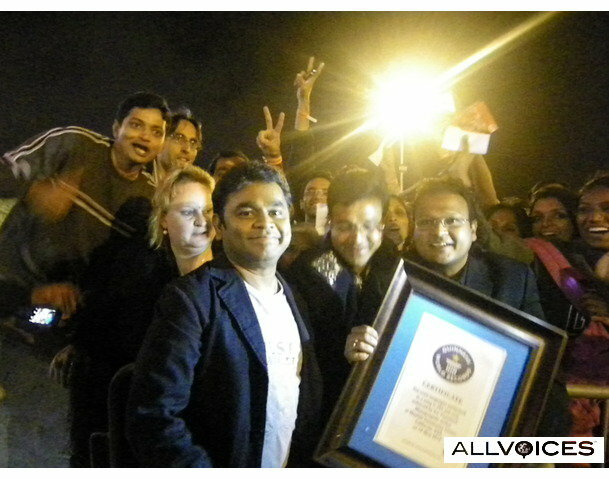 A R Rahman received Guinness Record in US ! Oakland, Bay Area, California, USA, September 12: “Wow. This is great,” said music maestro and Oscar winner A.R.Rahman on receiving his first-ever recognition by the Guinness Book of World Records at a glittering function held here on Sunday night. Donning the grease paint and enthralling the masses on the silver screen alone need not endear oneself to the millions of audience. Directing how fast the nimble fingers should dance on every musical instrument evolved the maestro, A.R.Rahman. When he sung ‘Maa tujhe salaam’…we all felt he is greeting our very own moms too so much so, we reciprocate it. But, Sai Manapragada, the boy next door (he belongs to Hyderabad) until a couple of decades ago, did it in 265 different ways. Rahman was presented the Guinness Record for the credit of being the original composer for the song, Maa Tujhe Salam, sung by Sai ‘Psychuck’ Manapragada in 265 Languages. Presenting the certificate, Sai “Psychuck” Manapragada of Psymphony (www.psymphonyradio.com) said: “The inspiring musical works of AR Rahman will continue to stimulate generations of Musicians to come”. The certificate was presented to A.R. Rahman amidst a lot of fanfare after his stellar performance in California that was attended by more than 10,000 people. The Guinness World Record Certificate to A R Rahman was presented by Psymphony’s Vice-President of Marketing, Saileel Vijaykar, Vice-President of Publicity and Broadcasting, Srinivasa Manapragada, and Guinness World Record-holder, Sai “Psychuck” Manapragada.